Pineapple halwa recipe (Pineapple sheera) – a sweet or dessert made from semolina, sugar, clarified butter and pineapple (pieces and puree). The basic sooji ka halwa aka sheera is the most popular sweet recipe in India. Today I am sharing the variation of it using pineapple in it. Most of the ingredients and procedure will be same as basic sheera recipe. Only addition is the pineapple and saffron. 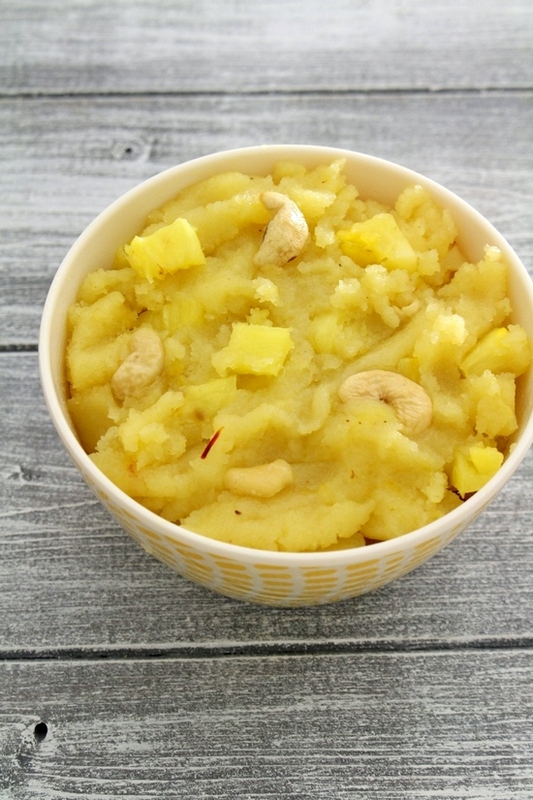 This halwa or sheera is also known as pineapple kesari in some regions of India. The ingredients will be exact same, but the procedure is slightly different. Sooji (Semolina or rava): There are two kinds of sooji available in the market. One is coarse verity and second is fine. For making halwa or sheera, I prefer to use fine semolina. But if you have coarse one available in your pantry, no worries use that. Ghee (Clarified butter): This is essential to make rich and perfect textured sheera. 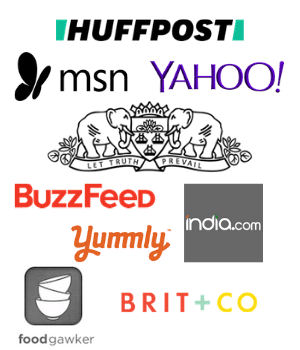 Please do not reduce the amount of ghee used here. Pineapple: For making this halwa, it is used two ways. Chopped pineapple provides some texture and you will have juicy bites here and there. While pineapple puree adds its flavor to the halwa. Always use ripe and sweet pineapple. Taste your pineapple first and accordingly adjust the sugar quantity. Mine was really sweet and juicy. So I have used ½ cup of sugar which gives perfect sweetness. The yellow color from pineapple puree along with saffron gave me nice bright yellow color to the halwa. Instead of saffron, you can use few drops of yellow or orange food color. 1) Take water in a saucepan and let it come to a simmer on medium heat. 2) On another stove, take ghee, semolina and saffron in a pan on medium-low heat. 3) Start roasting the sooji with stirring constantly. As it gets heated up, ghee will starts to melt down. 4) Keep roasting and stirring till it gets slight brown color or you will smell the toasty, nutty aroma of roasted sooji. You will also notice that ghee will starts to ooze out and the mixture will be bubbly, airy and very light. It will take about 7-8 minutes of roasting. 5) Now add chopped and pureed pineapple. 6) Mix well and continue cooking with stirring. 7) After few minutes, it will become thick. 8) Now add simmering, hot water and while adding water, keep stirring with spatula. Be careful, it may splutter a lot. 9) cook with stirring constantly for about 2 minutes. All the water will be absorbed by the sooji. 10) Now add sugar and mix. 11) As sugar melts, the mixture will again becomes runny. 12) Keep stirring and cooking till it gets thick and leave the sides of the pan. Also ghee will starts to ooze out from the sides. 13) Turn off the stove and add chopped cashew nuts. Pineapple halwa is ready to serve. 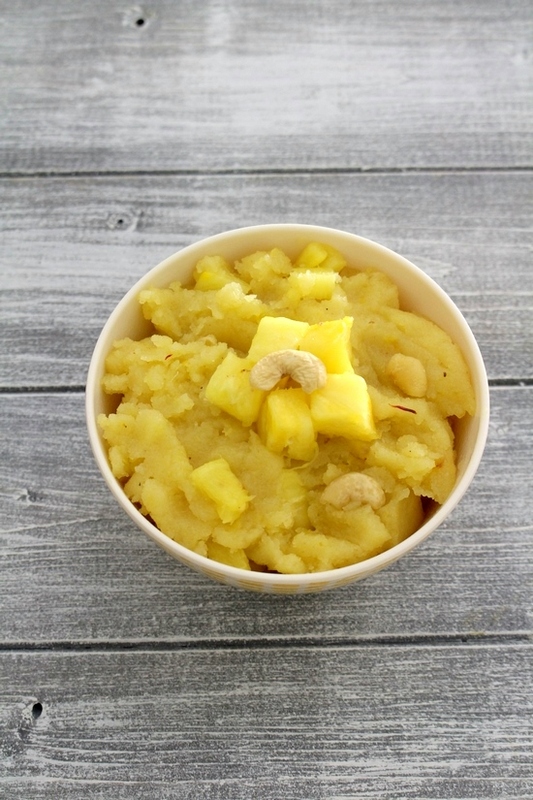 Serving suggestion: Serve this pineapple sheera warm or chilled as a dessert. Take water in a saucepan and let it come to a simmer on medium heat. On another stove, take ghee, semolina and saffron in a pan on medium-low heat. Keep roasting and stirring till it gets slight brown color or you will smell the toasty, nutty aroma of roasted sooji. You will also notice that ghee will starts to ooze out and the mixture will be bubbly, airy and very light. It will take about 7-8 minutes of roasting. Now add chopped and pureed pineapple. Mix well and continue cooking with stirring. After few minutes, it will become thick. Now add simmering, hot water and while adding water, keep stirring with spatula. Be careful, it may splutter a lot. cook with stirring constantly for about 2 minutes. All the water will be absorbed by the sooji. Keep stirring and cooking till it gets thick and leave the sides of the pan. Also ghee will starts to ooze out from the sides. add chopped cashew nuts. Mix well. Looks yummy. is pineapple pure available in market or you do it in grinder at home? just curious. I have just pureed fresh pineapple pieces in blender.